Good for fruit because of the potash in it. Only wood ash though, not coal! Apparently gooseberries thrive with a good sprinkling and it helps deter sawfly pests! – If you live in the north then plant later. It’s warmer in the south so they can usually plant sooner. – if your soil is wet then don’t plant. They’ll rot. – if your soil is frosty or covered in snow then hold off planting. Parnsips have an appalling germination rate if you plant them too soon. They like the soil to have warmed up a bit! Don’t plant a whole packet at once. Plant half, or quarter and then again a few weeks – either finish a row or start a new one. This list will depend on whether you like making jam or not. If you don’t then I can recommend strawberries and raspberries as well as almost all fruit trees. If you like making jam then add blackcurrants to the list. The reason for making jam is to preserve the flavour of fruit for the winter. Plant a fruit tree in your garden if you have room. If you don’t have much space get a dwarf one! Salad leaves are really popular. These will range from individual lettuces (flat and hearted) to mixed leaves that can be picked time and time again, or microleaves for gracing the dantiest of dishes. Grow in tubs or raised areas away from slugs or use a nemotode product aimed at getting rid of slugs. Radishes are probably the easiest thing to grow. Look out for aerial rats tail radishes (I have spare seeds at the moment) as they look like chilis and are a little hot! Runner beans are mouthwateringly good freshly picked. I rate them above peas. Grow plenty and then feed the neighbours too or fill the freezer. Peas are fantastic straight from the pods. You can never plant too many peas. If you get bored of them then your neighbours will love you for giving them a bag of peas in the pod. Don’t forget that the fresh bits of pea plant are also tasty. 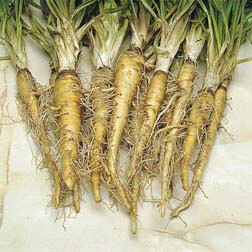 Carrots are delicious and if you have light sandy soil you’ll grow really good ones. For harder more clay soils use tubs of sandy compost. Courgettes are amazing when you’ve watched them grow over a few days. You can even eat the flowers battered if that’s what takes your fancy! A couple of plants that are well fed and watered will produce tons of courgettes for you and your neighbours. If at the end of the season you discover one you’ve missed picking and it’s huge then save this for halloween carving! Leeks – not too difficult if you start off in a pot and transplant. And grow enough and you’ll be eating leek and potato soup for months during the winter! Potatoes are unbeatable for flavour when you plant first earlies – or new potatoes as they’re known. Not complicated to grow and helps clear new land. Cabbage is something that sounds difficult but isn’t. If you like you can buy the plants ready grown as seedlings ready to into the right place on your plot. Tomatoes. It’s the smell of tomatoes growing in a greenhouse that evokes so many thoughts of delicious tomatoes. They always taste better than shop bought. Cherry, plum or normal! All sorts of colours too. Need greenhouse or similar space for getting good results – outdoor tomatoes more tricky. 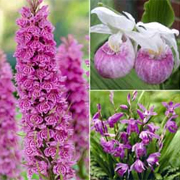 Orchid Hardy Collection – 3 plants NOW ONLY £14.99! Save £££s on this rarely offered collection of hardy orchids – they’re surprisingly easy to grow and will thrive in damp woodland borders and reliably moist soils, creating a fascinating talking point for your garden. Collection comprises 1x 9cm potted plant each of Marsh Orchid (Dactylorhiza majalis), Hyacinth Orchid (Bletilla striata) and Lady’s Slipper Orchid (Cypripedium reginae). ORDER NOW to take advantage of this fantastic offer. 3 plants only £14.99 – HALF PRICE! T&Cs: Offer cannot be used in conjunction with any other offer code and is only valid with orders placed online at www.thompson-morgan.com. For most trees you’re likely to be planting a single stake which comes up about 1/3 of the height of the tree (at planting not final height) will do. Put it in the hole before you put the tree in and then carefully put the tree in. The purpose of a stake is to allow the roots to anchor fully into the ground. This can take a couple of years. It’s ok for the top part to sway in the wind. Put the stake on the side of the tree of the prevailing wind (Which way the wind normally blows) so that when it’s windy the tree blows away from the stake but it should be held firm and not allowed to go past a certain amount. You can buy special tree ties or use folded back pieces of gaffer tape as these are soft, strong and will last for the few years they need to. You could also use plaited tights. Use a twisted loop to make it move less and be more secure. You can also insert a piece of pipe to allow easy watering but for most people this is something they’re not going to bother doing in normal years. Some people swear by two short stakes with a fastening between, but obviously you need two stakes per tree then. Thompson & Morgan will sell you tree stakes when you order trees from them. 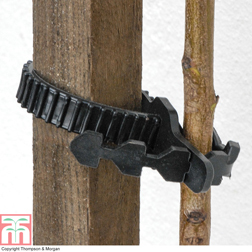 We can supply the necessary Stake and tie required when planting any of our fruit trees.Pack contains one 1½m (5 foot) treated timber stake and a plastic adjustable tie.PLEASE NOTE: These can only be ordered with trees, as they will be packed and sent together. Order now and get planting! Thompson & Morgan have these great gooseberries. They have offers on if you buy 3 of a kind too. Customer RatingThis unusual fruit bush is the result of a cross between a blackcurrant and a gooseberry which has produced a soft fruit with a delicious blackcurrant flavour. 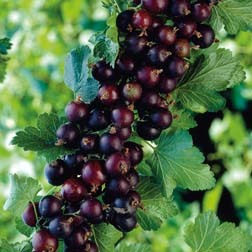 The leaves of Casseille look like those of a gooseberry whilst the fruit look like large blackcurrants. Each thornless bush is capable of producing several kilos of fruit with a very sweet taste and a hint of tartness. These very fragrant fruits, rich in Vitamin C, make the ideal addition to a fresh fruit salad or a summer puddings. Casseille bushed are self fertile and the berries can be harvested from mid July. Height and spread: 2m (6’, 6”). 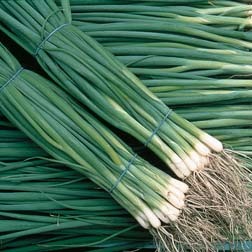 A superb Japanese bunching onion, Spring Onion Summer Isle has been bred for its sweet flavour and low pungency. Sow in succession for harvests during summer and autumn. Spring Onion Summer Isle is fantastic in salads and stir-fries. (Allium cepa) Culinary note: Some parts of these flowers are edible. For more details about edible flowers click here. (Sandwich Island). Delicious, delicate flavour likened to Oysters or Asparagus. Salsify is a good source of Vitamin C and potassium. Culinary note: Some parts of these flowers are edible. For more details about edible flowers click here. There are many types of rocket!